New England's Leader in Medical Malpractice & Personal Injury Law. Call (617) 720-4447 for free case review. 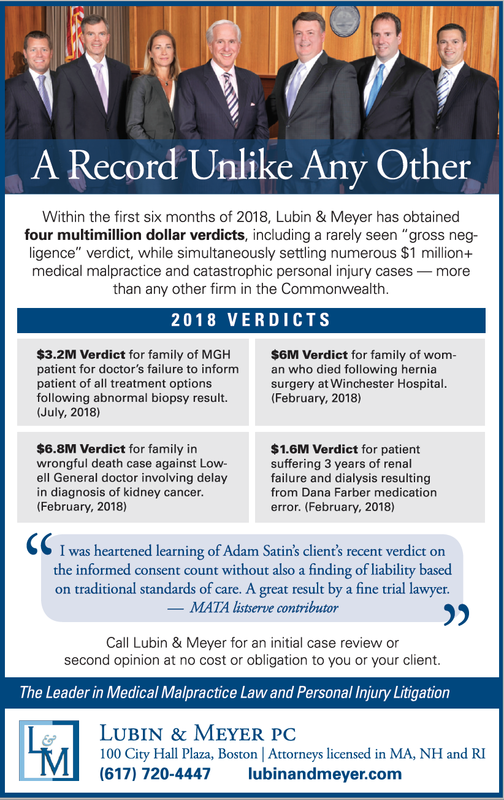 In the first six months of 2018, medical malpractice law firm Lubin & Meyer PC has achieved four multimillion dollar jury verdicts — including a rarely seen "gross neg­ligence" verdict — more than any other firm in the Commonwealth. The verdicts are listed below. Click on a link to view more information about any trial. Below is our recent ad in Massachusetts Lawyers Weekly. Questions about a possible medical malpractice lawsuit? Contact Lubin & Meyer for an initial case review or a second opinion at no cost. No obligation. Our attorneys are licensed and practicing in Massachusetts, New Hampshire and Rhode Island. New England's top medical malpractice law firm with attorneys licensed and practicing in Massachusetts, New Hampshire and Rhode Island. This Medical Malpractice and Personal Injury law firm blog is provided by: Lubin & Meyer PC — The innovative leader in medical malpractice and personal injury law — 100 City Hall Plaza, Boston, Massachusetts 02108. 617-720-4447 | 800-866-2889. Attorneys licensed in Massachusetts (MA), New Hampshire (NH) and Rhode Island (RI). ATTORNEY ADVERTISING: This information is provided for informational purposes only and does not offer legal advice. Use of this web site or e-mail does not establish an attorney-client relationship. Past performance does not guarantee future results. © 2016 Lubin & Meyer PC - Lawyers licensed in MA, NH, RI. Picture Window theme. Powered by Blogger.